During the summer months, the Shore points—and other tourist destinations— across New Jersey suddenly become a melting pot of cultures from around the world. As towns swell with new visitors, employers scramble to fill seasonal positions often passed on by area teens, so they are turning to the international community for help. Thanks to the international student exchange program known as the J-1 Summer Work Travel student visa program, they are able to fill countless jobs. This is a non-immigrant visa category for individuals who are approved to participate in work-and-study-based exchange visitor programs. According to Nathan Arnold of the U.S. Department of State’s Bureau of Educational and Cultural Affairs, the program provides thousands of university students from around the world the opportunity to experience American culture while working in the United States during their break from school. Arnold says that many of the participants say this is the only way they are able to come here and experience America. He adds that participants establish connections with U.S. citizens, build networks, improve English-language skills and form lifelong friendships. Nathalia Andrea González, a 21-year-old student from Colombia studying industrial engineering at Universidad Militar Nueva Granada, says that her favorite part of the program is getting to meet new people, make friends and learn about different cultures. “I also have the opportunity to share my own culture, food and language with others,” says González, who is currently working as a lifeguard at Morey’s Piers as well as helping out at one of their restaurants, Joe’s Fish Co. In addition to expanding their cultural horizons, González, Mihajloski and others in the program serve as much-needed labor for tourist destinations that struggle to fill positions that help keep their businesses running. Denise Beckson, director of operations and human resources for Morey’s Piers in Wildwood, says that the J-1 student visa program makes it possible for the Boardwalk to be up and running all summer long. As part of a seasonal resort town where she says the “traffic lights are turned off in the winter,” it’s not surprising that they cannot fully staff without also hiring international students. 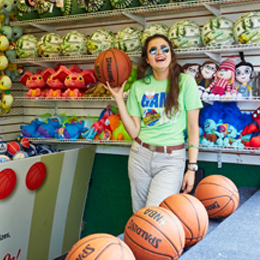 For Morey’s Piers, international students work primarily as ride operators, lifeguards, games operators, and in admissions, retail and food and beverage. But across Wildwood—and other New Jersey towns for that matter—international students also take positions in grocery stores, as cleaning staff or as desk clerks. To the question as to whether these international students are taking jobs away from American students, the businesses we spoke with gave a resounding “no.” They certainly also employ American workers but struggle to find enough who are willing to do the work. Though no cuts to the program have occurred, there was chatter last summer about the Trump Administration considering changes. Businesses in Wildwood say that cuts could be potentially “devastating” to the tourism industry. “With more than 150 hotels just in Wildwood, it would be devastating to our community not to have access to the J-1 program for hiring,” says Davis. “Cuts in the Summer Work Travel program would cause some Shore businesses to close entirely and others to cut their hours of operation,” adds Vicki Clark, president of the Cape May County Chamber of Commerce. As summer 2018 surges forward, Arnold says that the J-1 visa will continue to be implemented as it has in the past. In 2017, 104,923 international students participated in the program, according to Arnold. Of those, 5,083 came to the state of New Jersey. He expects summer 2018 to end up with a similar number. In terms of how students’ time is spent, much of it is working. However, students do also have opportunities to travel in their leisure time. Beckson says that Morey’s Piers runs bus trips to places like Niagara Falls or Washington, D.C.
González says that she is planning to participate in travel to Niagara Falls, Philadelphia and Six Flags Great Adventure, among other potential destinations. While she has already learned and experienced memories that are sure to last a lifetime, it is perhaps the friendships that González says will remain the most impactful.